UPDATE (2:45PM) -- Lee County Utilities reports that about 100 homes and a commercial business are impacted by this water main break and are currently without water. Door hangers from Lee County Utilities are being used to alert impacted customers. It’s anticipated that Lee County Utilities will restore service by late afternoon, at which point the impacted customers will have a 72-hour precautionary boil water period. A contractor is on site patching the impacted northbound lane so traffic can flow freely later tonight. 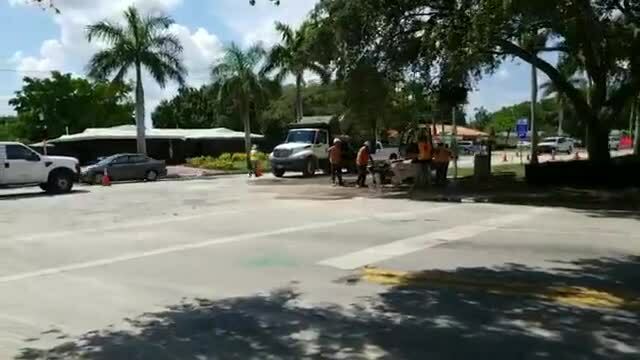 The Fort Myers Police department is advising motorists to avoid the area around McGregor Boulevard and Royal Palm Square Boulevard due to a water main break. Traffic on Northbound Royal Palm Square Blvd. has been blocked off and repair crews are on the scene. Traffic flow is expected to be returned by 5 p.m.
Officers are on scene directing traffic and there are no reported injuries. Please drive with care and be alert for holiday traffic congestion. Traffic Advisory – FMPD advising motorists to avoid the area around McGregor Blvd. & Royal Palm Square Blvd. due to a water main break. Traffic on Northbound Royal Palm Square Blvd. has been blocked, crews are on scene and repairs may take several hours, perhaps 10 or more.